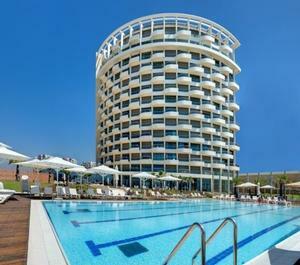 A new hotel located in north Tel Aviv.There are 65 luxury designed suites that extend across 13 floors. The hotel offers luxurious experience but full of peace and quiet Excellently located hotel business and entertainment center of Tel Aviv. All rooms and bedroom suites has, large sofa, bathroom, LCD tv, a fully equipped kitchenette. In addition the hotel offers the guests a luxurious spa, fully equipped gym and an outdoor swimming pool. Gourmet restaurant serves a rich selection of dairy dishes for breakfast, and of course there is an excellent menu for lunch and dinner. Executive Lounge is a great place for meetings and other meetings. Guests have easy access to the beach, and facilities rental bikes to explore the town, there is also free parking and free internet course. New suites designed an innovative and authentic style. Luxury and stunning beauty. Job quiet and relaxed atmosphere. At the suites: bedroom, large sofa, bathroom, TV LCD, fully equipped kitchen and espresso machine.